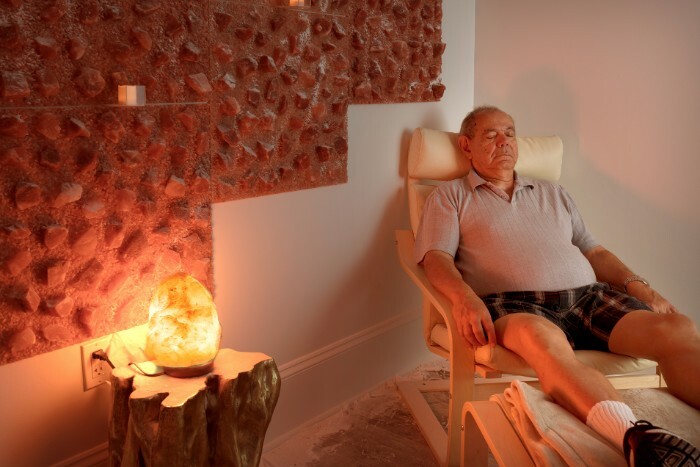 Our Salt Caves have been designed to help cystic fibrosis sufferers relieve their symptoms and feel better in a safe, peaceful environment that feels more like a spa than a high-tech treatment facility. Cystic fibrosis is one of the most dangerous diseases in the world. Mutual carriers of the cystic fibrosis gene pass down to their children and it is one of the most common life-shortening inherited diseases in the world. To date there is no cure. Treatment with the help of drugs like antibiotics and bronchodilators brings short term relief. Fortunately Salt Halo Therapy treatments not only brings relief but can also prevent the recurrence of symptoms. The patient inhales salty air which has bactericide, mucokinetic, hydrophilic and anti-inflammatory properties. If you are a carrier of cystic fibrosis, salt therapy treatment at our Salt Caves will bring relief by opening up the respiratory tract, clearing accumulated mucus and unclogging blockages in the bronchi and bronchioles. It also absorbs edema from the mucosa lining in the airway passages and reduces inflammation of the respiratory tract. Salt therapy treatment at our Salt Caves also facilitates the drainage of sinusitis; a common problem in patients suffering from cystic fibrosis. The salt therapy treatment sessions can also reduce your coughing and dependence on prescription drugs and gives a boost to your immune system. After completing the recommended number of treatment sessions people may receive benefits for as long as 6-12 months. Salt Halo Therapy treatment replicates the natural microclimate found in salt caves and mines but has the additional benefit of a highly-controlled environment. Our Salt Caves is a spa like environment and treatment takes place in our Salt Caves. Our professional staff is there to assist with any of your needs. Sessions in our Salt Caves lasts for 1 Hour for Adults, 30 minutes for Children & 15 minutes for Infants. Symptoms associated with cystic fibrosis include salty tasting skin, normal appetite but poor growth and poor weight gain, excess mucus production, frequent chest infections and coughing/shortness of breath. It also affects the digestive system as enzymes and bile fail to reach the intestine owing to the blocked ducts of pancreas and liver. Treatment includes the use of antibiotics and bronchodilators which have adverse side effects. If you or your children are have cystic fibrosis, contact us today and we will help bring you much needed relief.